Decision-theoretic analysis of how to optimally play Haghani & Dewey 2016's 300-round double-or-nothing coin-flipping game with an edge and ceiling better than using the Kelly Criterion. Computing and following an exact decision tree increases earnings by $6.6 over a modified KC. Haghani & Dewey 2016 experiment with a double-or-nothing coin-flipping game where the player starts with $25 and has an edge of 60%, and can play 300 times, choosing how much to bet each time, winning up to a maximum ceiling of $250. Most of their subjects fail to play well, earning an average $91, compared to Haghani & Dewey 2016’s heuristic benchmark of ~$240 in winnings achievable using a modified Kelly Criterion as their strategy. The KC, however, is not optimal for this problem as it ignores the ceiling and limited number of plays. We solve the problem of the value of optimal play exactly by using decision trees & dynamic programming for calculating the value function, with implementations in R, Haskell, and C. We also provide a closed-form exact value formula in R & Python, several approximations using Monte Carlo/random forests/neural networks, visualizations of the value function, and a Python implementation of the game for the OpenAI Gym collection. We find that optimal play yields $246.61 on average (rather than ~$240), and so the human players actually earned only 36.8% of what was possible, losing $155.6 in potential profit. Comparing decision trees and the Kelly criterion for various horizons (bets left), the relative advantage of the decision tree strategy depends on the horizon: it is highest when the player can make few bets (at b=23, with a difference of ~$36), and decreases with number of bets as more strategies hit the ceiling. In the Kelly game, the maximum winnings, number of rounds, and edge are fixed; we describe a more difficult generalized version in which the 3 parameters are drawn from Pareto, normal, and beta distributions and are unknown to the player (who can use Bayesian inference to try to estimate them during play). Upper and lower bounds are estimated on the value of this game. In the variant of this game where subjects are not told the exact edge of 60%, a Bayesian decision tree approach shows that performance can closely approach that of the decision tree, with a penalty for 1 plausible prior of only $1. Two deep reinforcement learning agents, DQN & DDPG, are implemented but DQN fails to learn and DDPG doesn’t show acceptable performance, indicating better deep RL methods may be required to solve the generalized Kelly game. …Prior to starting the game, participants read a detailed description of the game, which included a clear statement, in bold, indicating that the simulated coin had a 60% chance of coming up heads and a 40% chance of coming up tails. Participants were given $25 of starting capital and it was explained in text and verbally that they would be paid, by check, the amount of their ending balance subject to a maximum payout. The maximum payout would be revealed if and when subjects placed a bet that if successful would make their balance greater than or equal to the cap. We set the cap at $250…Participants were told that they could play the game for 30 minutes, and if they accepted the $25 stake, they had to remain in the room for that amount of time.5 Participants could place a wager of any amount in their account, in increments of $0.01, and they could bet on heads or tails…Assuming a player with agile fingers can put down a bet every 6 seconds, that would allow 300 bets in the 30 minutes of play. The basic idea of the Kelly formula is that a player who wants to maximize the rate of growth of his wealth should bet a constant fraction of his wealth on each flip of the coin, defined by the function (2⋅p)−1, where p is the probability of winning. The formula implicitly assumes the gambler has log utility. It’s intuitive that there should be an optimal fraction to bet; if the player bets a very high fraction, he risks losing so much money on a bad run that he would not be able to recover, and if he bet too little, he would not be making the most of what is a finite opportunity to place bets at favorable odds…We present the Kelly criterion as a useful heuristic a subject could gainfully employ. It may not be the optimal approach for playing the game we presented for several reasons. The Kelly criterion is consistent with the bettor having log-utility of wealth, which is a more tolerant level of risk aversion than most people exhibit. On the other hand, the subjects of our experiment likely did not view $25 (or even $250) as the totality of their capital, and so they ought to be less risk averse in their approach to maximizing their harvest from the game. The fact that there is some cap on the amount the subject can win should also modify the optimal strategy…In our game, the Kelly criterion would tell the subject to bet 20% ((2⋅0.6)−1) of his account on heads on each flip. So, the first bet would be $5 (20% of $25) on heads, and if he won, then he’d bet $6 on heads (20% of $30), but if he lost, he’d bet $4 on heads (20% of $20), and so on. …If the subject rightly assumed we wouldn’t be offering a cap of more than $1,000 per player, then a reasonable heuristic would be to bet a constant proportion of one’s bank using a fraction less than the Kelly criterion, and if and when the cap is discovered, reducing the betting fraction further depending on betting time remaining to glide in safely to the maximum payout. For example, betting 10% or 15% of one’s account may have been a sound starting strategy. We ran simulations on the probability of hitting the cap if the subject bet a fixed proportion of wealth of 10%, 15% and 20%, and stopping when the cap was exceeded with a successful bet. We found there to be a 95% probability that the subjects would reach the $250 cap following any of those constant proportion betting strategies, and so the expected value of the game as it was presented (with the $250 cap) would be just under $240. However, if they bet 5% or 40% of their bank on each flip, the probability of exceeding the cap goes down to about 70%. This game is interesting as a test case because it is just easy enough to solve exactly on a standard computer in various ways, but also hard enough to defeat naive humans and be nontrivial. The sample was largely comprised of college age students in economics and finance and young professionals at finance firms. We had 14 analyst and associate level employees at two leading asset management firms. The sample consisted of 49 males and 12 females. Our prior was that these participants should have been well prepared to play a simple game with a defined positive expected value…Only 21% of participants reached the maximum payout of $250,7 well below the 95% that should have reached it given a simple constant percentage betting strategy of anywhere from 10% to 20%.8 We were surprised that one third of the participants wound up with less money in their account than they started with. More astounding still is the fact that 28% of participants went bust and received no payout. That a game of flipping coins with an ex-ante 60/40 winning probability produced so many subjects that lost everything is startling. The average ending bankroll of those who did not reach the maximum and who also did not go bust, which represented 51% of the sample, was $75. While this was a tripling of their initial $25 stake, it still represents a very sub-optimal outcome given the opportunity presented. The average payout across all subjects was $91, letting the authors off the hook relative to the $250 per person they’d have had to pay out had all the subjects played well. Instead of expected earnings of ~$240, the players earned $91 - forfeiting $149. However, if anything, the authors understate the underperformance, because as they correctly note, the Kelly criterion is not guaranteed to be optimal in this problem due to the potential for different utility functions (what if we simply want to maximize expected wealth, not log wealth? ), the fixed number of bets & the ceiling, as the Kelly criterion tends to assume that wealth can increase without limit & there is an indefinite time horizon. It’s true that 40% of the time, we go bankrupt and so we couldn’t play again… but there are no more plays in b=1 so avoiding bankruptcy boots nothing. To solve this equation, we can explore all possible sequences of bets and outcomes to a termination condition and reward, and then work use backwards induction, defining a decision tree which can be (reasonably) efficiently computed using memoization/dynamic programming. similarly, if the wealth ever reaches the upper bound of $250, the optimal strategy will effectively end the game by always betting $0 after that regardless of how many bets remain, since it can’t do better than $250 and can only do worse. These two shortcuts will make the tree much easier to evaluate because many possible sequences of bet amounts & outcomes will quickly hit $0 or $250 and require no further exploration. the value of 1 bet depends on the ceiling and current wealth: whether $250 is >2x current wealth. If the ceiling more than twice current wealth, the optimal strategy with 1 bet left is to bet everything, since that has highest EV and there’s no more bets to worry about going bankrupt & missing out on. We can write down the value function as a mutual recursion: f calculates the expected value of the current step, and calls V to estimate the value of future steps; V checks for the termination conditions w=$0/$250 & b=0 returning current wealth as the final payoff, and if not, calls f on every possible action to estimate their value and returns the max… This mutual recursion bottoms out at the termination conditions. As defined, this is grossly inefficient as every node in the decision tree will be recalculated many times despite yielding identical deterministic, referentially transparent results. So we need to memoize results if we want to evaluate much beyond b=5. Of course, even with memoization and reducing the branching factor, it’s still difficult to compute the value of the optimal strategy all the way to b=300 because the exponentially increasing number of strategies still need to be computed at least once. With this R implementation, trees for up to b=150 can be computed with 4GB RAM & ~16h. So as the number of bets escalates, our expected payoff increases fairly quickly and we can get very close to the ceiling of $250 with canny betting. If we do not have enough RAM to expand the full decision tree to its terminal nodes, there are many ways to approximate it. A simple one is to expand the tree as many levels far down as possible, and then if a terminal node is reached, do exact backwards induction, otherwise, at each pseudo-terminal node, approximate the value function somehow and then do backwards induction as usual. The deeper the depth, the closer the approximation becomes to the exact value, while still doing optimal planning within the horizon. 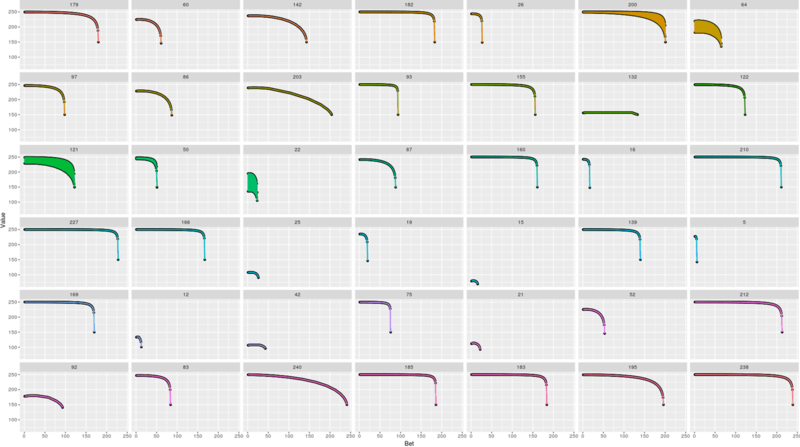 One way to approximate it would be to run a large number of simulations (perhaps 100) taking random actions until a terminal node is hit, and take the mean of the total values as the estimate. This would be a Monte Carlo tree evaluation. (This forms the conceptual basis of the famous MCTS/Monte Carlo tree search.) A random policy is handy because it can be used anywhere, but here we already know a good heuristic which does better than random: the KC. So we can use that instead. This gives us as much optimality as we can afford. As expected the KC can do well and is just as fast to compute as a random action, so using it will give much better estimates of the value function for free. One is also curious what the optimal strategy is, not just how much we can make with the optimal strategy given a particular starting point. As defined, I can’t see how to make mV return the optimal choices along the way, since it has to explore all choices bottom-up and can’t know what is optimal until it has popped all the way back to the root, and state can’t be threaded in because that defeats the memoization. Most of the time is spent in functions which appear nowhere in our R code, like lapply or deparse, which points to the behind-the-scenes memoise. Memoization should be fast because the decision tree can be represented as nothing but a multidimensional array in which one does lookups for each combination of w/b for a stored value V, and array lookups ought to be near-instantaneous. But apparently there is enough overhead to dominate our decision tree’s computation. While the overhead is not as bad as memoise, performance is still not great. iterate f x = x : iterate f (f x) doesn’t need to think much about memoization. From right to left, the line reads “Given how much each money amount is worth when n games are left, you can zip together that list’s prefixes and suffixes to get a list of options for each money amount at (n+1) games left. Use the best for each, computing the new utility as a weighted average of the previous. At 0 and 250 we have no options, so we must manually prescribe utilities of 0 and 250. Inductively use this to compute utility at each time from knowing that at the end, money is worth itself. Look at the utilites at 300 games left. Look at the utility of $25.” Inductively generating that whole list prescribes laziness. Since it’s Haskell, we can switch to compiled code and use fast arrays. The second one is more low-level and uses laziness/“tying the knot” to implement the memoization; it is the fastest and is able to evaluate memo 25 300 in <12s: the value turns out to be $246. (If we assume that all games either end in $250 or $0, then this implies that 246250=0.984 or >98.4% of decision-tree games hit the max, as compared to Haghani & Dewey’s estimate that ~95% of KC players would.) The memoization is done internally, so to access all values we do more logic within the lexical scope. -- 3. Memoised recursion using 'memoize' library; slower. We could go even further with zip [1..3000] (memo3 (repeat 25) [1..3000]) (which takes ~118s). Interestingly, the value stops increasing around b=2150 (V=249.99009946798637) and simply repeats from there; it does not actually reach 250. With the exact penny version, the value of b=300 is now $246.6062932 (taking ~3746s compiled), so the approximation costs an expected value of only $0.61. The full run reveals that convergence happens at b=1932 (which can be computed in ~48503s compiled), past which there is no need to compute further. // given pass n in "from", compute pass n-1 in "to"
For levels of parallelism on my laptop from 1-8 threads, the average times are: 28.98s/15.44s/10.70s/9.22s/9.10s/8.4s/7.66s/7.20s. For the most part they do generally follow a quadratic or inverted-V like shape, with the exception of several which wiggle up and down while following the overall curve (numeric or approximation error?). The value function winds up looking simple, a smooth landscape tucked down at the edges, which is perhaps not too surprising, as the optimal betting patterns tend to be small amounts except when there are very few rounds left (and one should bet most or all of one’s wealth) or one is nearing the maximum wealth cap (and should very gradually glide in). Some experimenting with fitting polynomial regressions did not give any decent fits for less than 5 degrees, but probably some combination of logs and polynomials could compactly encode the value function. 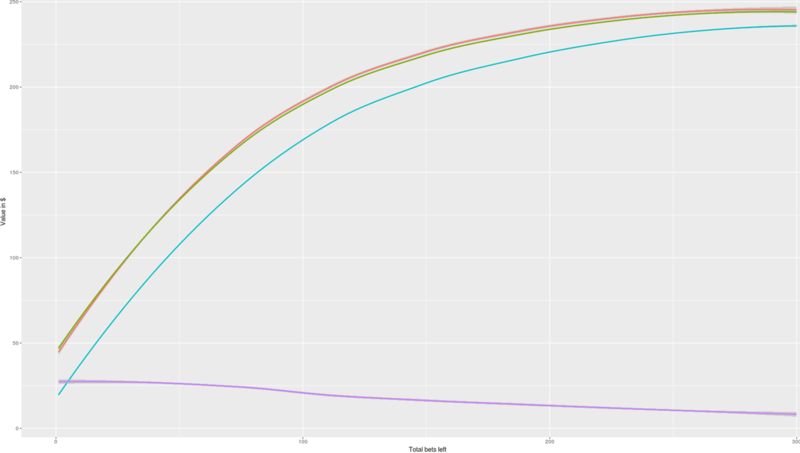 Simulation of winnings over a sample of b=300 games while using the optimal strategy. We can also examine how the strategy does for all the other possible horizons and compare with the Kelly. So the decision tree does outperform the 20% KC, and not by trivial amounts either for many possible b, either in relative or absolute terms: for b=23, the estimated gain is $37.1. The decision tree doesn’t require the full b=300 to often hit the ceiling, although the KC will. However, the performance edge goes down as the horizon gets more distant, and we’ll see that as far out as b=300, the advantage shrinks to ~$6 as the ceiling is hit almost all the time by decent strategies (as we know from Haghani & Dewey 2016’s analysis that KC hits the ceiling ~95% of the time with b=300, although of course it will do so far less often for shorter runs like b=50). The original Kelly coinflip game has a clear way to make it more general and difficult: randomize the 3 key parameters of edge/max wealth/rounds and hide them, turning it into a partially-observed Markov decision process. To solve a POMDP one often has to record the entire history, but with judicious choice of what distribution we randomize the 3 parameters from, we can make it both plausibly reflecting the human subjects’ expectations and allow summarizing the history in a few sufficient statistics. A variant on this problem is when the probability of winning is not given, if one doesn’t know in advance p=0.6. How do you make decisions as coin flips happen and provide information on p? Since p is unknown and only partially observed, this turns the coin-flip MDP into a POMDP problem. A POMDP can be turned back into a MDP and solved in a decision tree by including the history of observations as more parameters to explore over. The curse of dimensionality can be tamed here a little by observing that a history of coin-flip sequences is unnecessary - it doesn’t matter what order the coin flips happen in, only the number of wins and the number of total coin-flips matter (are the sufficient statistics). So we only need to augment wealth/rounds/bet-amount with wins/n. And one can compute p from wins/n by Bayesian updates of a prior on the observed coin flip results, treating it as a binomial problem of estimating p distributed according to the beta distribution. This beta Bayesian update is easy and doesn’t require calling out to a library: with a beta uniform prior (Beta(1,1)), update on binomial (win/loss) is conjugate with the simple closed form posterior of Beta(1+win, 1+n-win); and the expectation of the beta is 1+win / 1+n. Then our expected values in f simply change from 0.6/0.4 to expectation/1-expectation. Ideally we would use the prior of the participants in the experiment, to compare how well they do compared to the Bayesian decision tree, and estimate how much mistaken beliefs cost them. Unfortunately they were not surveyed on this and the authors do not give any indication of how much of an edge the subjects expected before starting the game, so for analysis, we’ll make up a plausible prior. We know that they know that 100% is not an option (as that would be boring) and <50% is impossible too since they were promised an edge; but it can’t be too high because then everyone would win quickly and nothing would be learned. I think a reasonable prior would be something like 70%, but with a lot of room for surprise. let’s assume a weak prior around 70%, which is equivalent to playing 10 games and winning 7, so Beta(7, 3). This prior leads to somewhat more aggressive betting in short games as the EV is higher, but overall performs much like the decision tree. -- Binary search on bitonic function. -- Memoised recursion using 'memoize' library; slower. For our prior, w=25, and b=300, we can evaluate run memo (7+1) (3+1) 300 25 :: Dual and find that the subjective EV is $207.238 and the actual EV is $245.676. And since we know from earlier that an agent following the optimal policy believing p=0.6 would earn $246.606, it follows that the Bayesian agent, due to its ignorance, loses ~$1. So the price of ignorance (regret) in this scenario is surprisingly small. Why is the Bayesian decision tree able to perform so close to the known-probability decision tree? I would guess that it is because all agents bet small amounts in the early rounds (to avoid gambler’s ruin, since they have hundreds of rounds left to reach the ceiling), and this gives them data for free to update towards p=0.6; the agent which knows that p=0.6 can bet a little more precisely early on, but this advantage over a few early rounds doesn’t wind up being much of a help in the long run. With b=300, there are so many rounds available to bet, that the details don’t matter as much; while it there are only a few bets, the maximizing behavior is to bet a lot so the regret for small b is also probably small; the largest regret for not knowing p is probably somewhere, like with the KC vs decision tree, in the small-medium area of b. Another variant would be to make the stopping time uncertain; strictly speaking, the game wasn’t fixed at exactly 300 rounds, that was just their guess at how many rounds a reasonably fast player might get in before the clock expired. From the player’s perspective, it is unknown how many rounds they will get to play although they can guess that they won’t be allowed to play more than a few hundred, and this might affect the optimal strategy. One way to calculate this would be to assume that the player doesn’t learn anything about the stopping time while playing, and merely has a prior over the stopping time. For example, N(300,25). The game stopping can be seen as a third probabilistic response to a player’s bet, where each move with some sp, if it happens the number of bets left immediately becomes b=0 (so they win their current w) and they win the net value V(w,0); and if it doesn’t happen the value is the usual 0.6*V(w+x, b-1) + 0.4*V(w-x, b-1). Or in longer form, the value of a action/bet x is (1-sp)*(0.6*V(w+x,b-1) + 0.4*V(w-x,b-1)) + sp*V(w,0). This has the difficulty that hypothetically, a game might go on indefinitely long, but since a player must eventually hit $0 or $250 and stop playing, it would turn out like the penny simulator - after a few thousand rounds, the probability of having not reached $250 is so small it can’t be handed by most software. The problem is more that this expands the states out enough to again make it unevaluable, so it helps to put an upper bound. So the problem becomes, playing the game knowing that the game might stop with a certain sp (eg 0.01) each round or stops at an upper limit number of rounds (eg b=300). This can be extended to scenarios where we do learn something about the stopping time, similarly to the coin-flip probability, by doing Bayesian updates on sp. Or if sp changes over rounds. If we had a distribution N(300,25) over the stopping time, then the probability of stopping at each round can change inside the value function given an additional argument n for rounds elapsed as the sufficient statistic. The maximum payout would be revealed if and when subjects placed a bet that if successful would make their balance greater than or equal to the cap. We set the cap at $250. A convenient distribution for such a cap would be the Pareto distribution, parameterized by a minimum xm and a tail parameter, α. If xm is set to something like 100 (the agent thinks the cap is >$100), for most rounds, the agent would not be able to update this, but towards the end, as it exceeds $100, it then updates the posterior - if it is allowed to make a bet of $50 at $100, then xm becomes 150 while α remains the same, and so on. In this case, the maximum observed wealth is the sufficient statistic. The posterior mean of the cap is then α⋅xmα−1. A reasonable prior might be α=5 and xm=200, in which case the mean wealth cap is 250. What is the value of this full POMDP game with uncertain wealth cap, stopping time, and edge? We can approximate it with our pre-existing value function for a known stopping time/edge/max wealth, sampling from the posterior; for example, we might draw 1000 values from NN(300,25), the Pareto, the Beta etc, calculate the value of each set of parameters, and taking the mean value. Since the value of information is always zero or positive, the value of the POMDP with known parameters must be an upper bound on its true value, since we can only do worse in each game by being ignorant of the true parameters and needing to infer them as we play; so if we calculate a value of $240 or whatever, we know the POMDP must have a value <$240, and that gives a performance target to aim for. and then we can modify nshepperd’s Haskell code to allow the edge and wealth cap to be modifiable, and then we simply run memo over the 1000 possible sets of parameters, and take the mean. Using the raw samples turns out to be infeasible in terms of RAM, probably because higher wealth caps (which are Pareto distributed and can be extremely large) increases dimensionality too much to evaluate in my ~25GB RAM, so the wealth cap itself must be shrunk, to TODO $1000? which unfortunately muddles the meaning of the estimate since now it’s a lower bound of an upper bound, or to reverse it, value of clairvoyant play assuming that many games have a lower wealth cap than they do. In the general game, it performs poorly because it self-limits to $250 in the many games where the max cap is higher, and it often wipes out to $0 in games where the edge is small or negative. Since the Bayesian decision tree is too hard to compute in full, we need a different approach. Tabular approaches in general will have difficulty as the full history makes the state-space vastly larger, but also so do just the sufficient statistics of wins/losses + rounds elapsed + maximum observed wealth. One approach which should be able to cope with the complexities would be deep reinforcement learning, whose neural networks let them optimize well in difficult environments; unfortunately, the sparsity of rewards in the Kelly coinflip game (receiving a reward only every ~300 steps) will make solving the game much harder for the agents. To create a deep RL agent for the generalized Kelly coin-flip game, I will use the keras-rl library of agents, which is based on the Keras deep learning framework (backed by TensorFlow); deep learning is often sensitive to choice of hyperparameters, so for hyperparameter optimization, I use the hyperas wrapper around hyperopt (paper). keras-rl offers primarily3 DQN (Mnih et al 2013) and DDPG (Lillicrap et al 2015). DQN is a possibility but for efficiency4 most DQN implementations require/assume a fixed number of actions, which in our case of penny-level betting, implies having 25,000 distinct unordered actions. I tried prototyping DQN for the simple Kelly coin-flip game using the keras-rl DQN example, but after hours, it still had not received any rewards - it repeatedly bet more than its current wealth, equivalent to its current wealth, and busting out, never managing to go 300 rounds to receive any reward and begin learning. (This sort of issue with sparse rewards is a common problem with DQN and deep RL in general, as the most common forms of exploration will flail around at random rather than make deep targeted exploration of particular strategies or try to seek out new regions of state-space which might contain rewards.) One possibility would have been to ‘cheat’ by using the exact value function to provide optimal trajectories for the DQN agent to learn from. DDPG isn’t like tabular learning but is a policy gradient method (Karpathy explains policy gradients). With deep policy gradients, the basic idea is that the ‘actor’ NN repeatedly outputs an action based on the current state, and then at the end of the episode with the final total reward, if the reward is higher than expected, all the neurons who contributed to all the actions get strengthened to be more likely to produce those actions, and if the reward is lower than expected, they are weakened. This is a very indiscriminate error-filled way to train neurons, but it does work if run over enough episodes for the errors to cancel out; the noise can be reduced by training an additional ‘critic’ NN to predict the rewards from actions, based on an experience replay buffer. 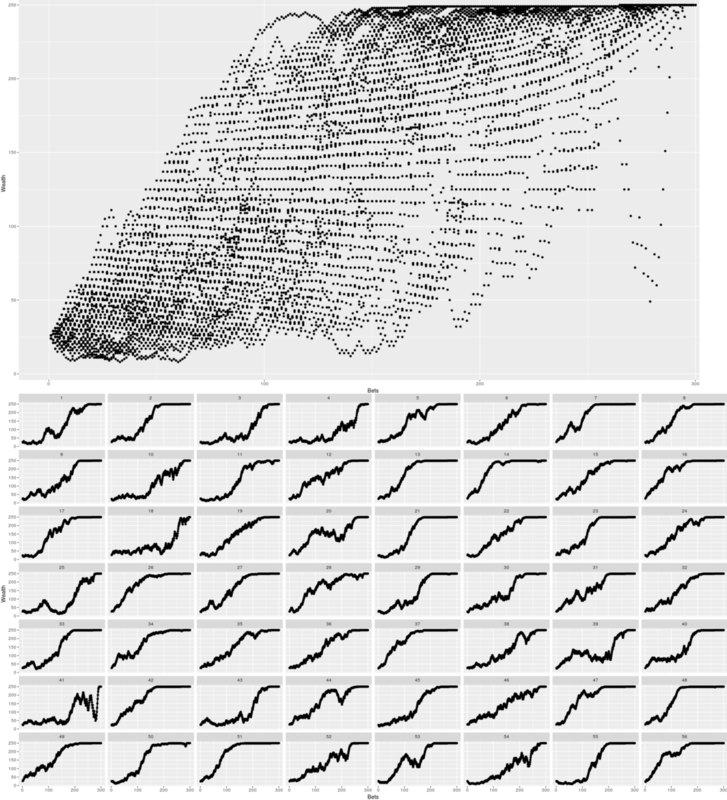 The NNs are usually fairly small (to avoid overfitting & because of the weak supervision), use RELUs, and the actor NN often has batchnorm added to it. (To prevent them from learning too fast and interfering with each other, a copy is made of each called the ‘target networks’.) For exploration, some random noise is added to the final action; not epsilon-random noise (like in DQN) but a sort of random walk, to make the continuous action consistently lower or higher (and avoid canceling out). A continuous action would have less of an unordered action/curse of dimensionality required switching from DQN to DDPG (example). Unfortunately, DDPG also had initialization problems in overbetting, as its chosen actions would quickly drift to always betting either very large positive or negative numbers, which get converted to betting everything or $0 respectively (which then always result in no rewards via either busting & getting 0 or going 300 rounds & receiving a reward of 0), and it would never return to meaningful bets. To deal with the drift/busting out problem, I decided to add some sort of constraint on the agent: make it choose a continuous action 0-1 (squashed by a final sigmoid activation rather than linear or tanh), and convert it into a valid bet, so all bets would be meaningful and it would have less of a chance to overbet and bust out immediately. (This trick might also be usable in DQN if we discretize 0-1 into, say, 100 percentiles.) My knowledge of Keras is weak, so I was unsure how to convert an action 0-1 to a fraction of the agent’s current wealth, although I did figure out how to multiply it by $250 before passing it in. This resulted in meaningful progress but was sensitive to hyperparameters - for example, the DDPG appeared to train worse with a very large experience replay buffer than with the Lillicrap et al 2015 setting of 10,000. For the simple Kelly coin-flip problem, the previous experiment with training based on the exact value function demonstrates that 400/300 neurons would be overkill, and probably a much smaller 3-layer network with <128 neurons would be more than adequate; the discount/gamma being set to 0.99 for Kelly is questionable, as almost no steps result in a reward, and a discount rate of 0.99 would imply for a 300 round game that the final reward from the perspective of the first round would be almost worthless (since 0.99300=0.049), so a discount rate of 0.999 or even just 1 would make more sense; because the reward is delayed, I expect the gradients to not be so helpful, and perhaps a lower learning rate or larger minibatch size would be required; finally, the exploration noise is probably too small, as the random walk would tend to increase or decrease bet amounts by less than $1, so probably a larger σ would be better. With these settings, DDPG can achieve an average per-step/round reward of ~0.8 as compared to the optimal average reward of 0.82 ($246 over 300 steps/rounds). Each agent/sample is trained ~8h and is evaluated on mean total reward over 2000 episodes, with 120 samples total. # Get the environment and extract the number of actions. # Next, we build a very simple model. # pass into a single sigmoid to force a choice 0-1, corresponding to fraction of total possible wealth. # After training is done, we save the final weights. # Finally, evaluate our algorithm for n episodes.